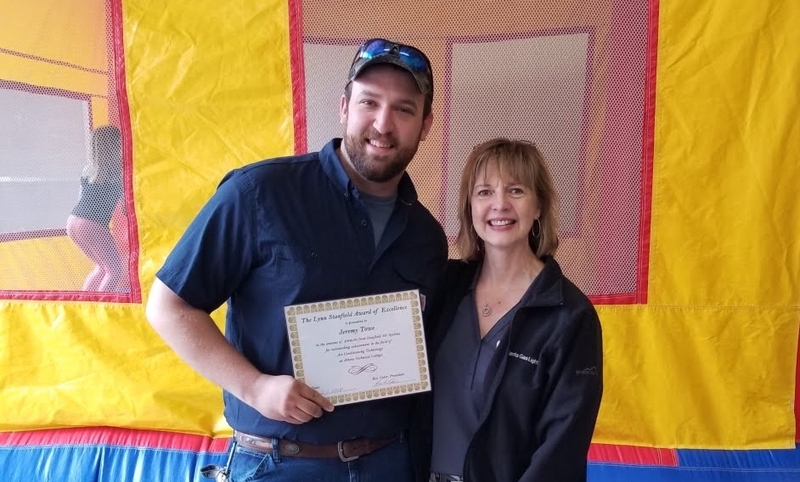 On Saturday, April 7, we celebrated our 50th anniversary with a birthday party for Stanfield Air Systems, and it was a great time! It was so great to see the faces of many of our valued customers, business partners, friends, and family. We enjoyed BBQ and cake, kids jumped in a bouncy house and the rain didn't dampen our spirits at all! We were so honored to have Athens Mayor Nancy Denson join us, and she surprised Sally Stanfield Allen with the Key to the City! What an honor! Rex Coker of Stanfield, worked with Athens Technical College to establish the Lynn Stanfield Scholarship to their Air Conditioning Technology program! The scholarship is awarded annually to a student with a 3.0 GPA or higher who has been nominated by his instructors. The scholarship honors the founder of Stanfield Air Systems, Lynn Stanfield, who made a profound impact on the heating and cooling industry in Athens. As Carter Stanfield said, "If you live in Athens and someone works on your AC, then it’s very likely that they are a Stanfield, work for a Stanfield, or were taught by a Stanfield." Congratulations to Jeremy Towe, the first recipient of the scholarship! He's pictured here with Sally, who awarded the scholarship to him at the party. We want to take a moment to thank everyone who came, those who sent well wishes, and everyone who has supported Stanfield over the years. Thanks for 50 years, and here's to 50 more!